A new season has started for cricket and football here in Bangladesh and, though not as lucrative as the European Leagues or IPL, it started with the transfers. Premier Division Cricket League, the most coveted domestic cricket tournament in our country and professional football league B-League will be underway in about a month and the teams are signing new players as well as keeping some old soldiers with renewed contracts. During this time of the year tours for the national cricketers are somewhat lesser in number than the previous years. Also the team is performing well so there are high demands for the top performing players. The ICL-goers are back as well. As such price tags for some of the proven performers have sky rocketed. The icon of Bangladeshi cricket these few months has been Shakib al Hasan and captain Mashrafe. This transfer window has provided them with plenty of things of joy. Together they are the highest paid cricketers this season, both of them bagging taka 20 lacs signing up for Abahani Limited. Tamim Iqbal also joins them signing up for Mohamedan for the same amount after some initial talks with title holders Abahani for the sum of 15 lacs. Dhaka giants Mohamedan, also put up a competing team. With Tamim at the helm, they have the services of Ashraful, Dollar Mahmud and Mahmudullah and looking forward to regain the trophy after 8 seasons. Other clubs like Gazi Tank, Old DOHS, Biman, Surjo Torun have also splashed enough money to lure in players. Top performers in the last ICL, Alok Kapali, Aftab Ahmed and others are also getting teams. But one thing is worrisome though, that is the lack of contracts for some of the national players. Like other seasons BCB has enforced a pool system making it so that the teams can't pick more than 4 national cricketers. So while some players are getting money splashed at their feet, some comrades of them are finding it difficult to find a team to play for. The bowlers are getting a handful of these as teams prefer to have more batsmen from the pool than the bowlers, particularly pacers, as they find them unprofitable. While in cricket Abahani Limited have bagged the best players in the circuit, in football it is their arch-rivals Mohamedan who did the same. They have the services of 7 of the current national team players. Jahid Hossein Emily, the prime striker at the moment in Bangladesh has changed sides this year and joined the black-white team for an amount of taka 15 lacs. Other leading players are also getting a good pay. Abahani and Muktijoddha Samsad KC also have good teams. But favorites not-so-long-ago, Brothers' Union and Sheikh Russel KC, has seemingly failed to manage a good enough to team to fight for the championships this season. Still the title race is open, because the best players not all the time guarantee the cup. The foreign players are expected to play their roles in the title race, with each team allowed to register 5 foreigners and play any 4 of them. It may be good that the players are getting a good salary and all that, but keeping the games on the ground is more important. Apart from the established players, young talents and promising fellows should also be given a handsome pay. If they fall out, that will spell harm for the sports in general. The pool system, in both cricket and football, are doing more harm than good and the governing bodies should look into it sincerely. THE silver Honda swooshed through the greenery, winding its way through the entwined bushes of Alton. It seemed to be more excited than me, to reach Alton Towers. When we finally drove through the regal ivory gates I realized that my imagination had betrayed me. The magical aura of the theme park overwhelmed me. After dropping us safely to our destination my mother's friend who was driving the car left. I had a feeling as if the car was groaning on its way out. I could only see the colourful monorail, the soaring cable cars on top of the high gates. Then after I slid in my e-ticket through the check-in machine, I entered into another planet. 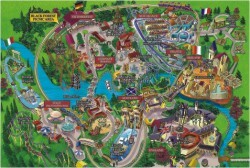 The planet was named Alton Towers and as I skimmed through its map which lay in front of us I knew I was in for a blast. My sister was accompanying me and I knew I could only trust on my sister to take me to the rides as my mother is unreasonably afraid of heights. I had been looking forward to Alton Towers since the first day of my glorious trip to England. It was the 19th day of the month of June, 2009. I rushed eagerly to the first ride that came in my view. It was The Nutty Squirrel and the only favourite ride of my mother. It was a fun ride with acorns and mischievous squirrels. Next I ventured on going to the Spinball Whizzer which was an extremely scary ride. My mum freaked out the instant she saw how the carriages soared onto great heights. The line for this ride was longer than the tail of the longest snake because it was such an adventurous ride. I shivered with a mixture of fright and excitement spiced with the screaming of those already spinning on the top. As soon as we attached our seatbelts, the carrier whizzed to the top like a pinball. All of a sudden we went upside down and all the blood rushed to my head as the the ride circled in loops. My sister and I screamed as we headed straight for the ground, and when the carrier was on the verge of crashing it hung in mid air for a few seconds and landed smoothly on its starting place. But yet it was not the scariest ride which I had survived. I had been aboard this Spin thriller for approximately five minutes. Next, my sister and I proceeded to the Forbidden valley which was famous for its big and daunting rides. Here we rode on two nerve-racking rides which were sequentially the 'Air' and the 'Nemesis'. The 'Air' was a ride that actually gives the feeling that someone is hanging in mid-air. While I was on it I felt as if I was flying weightlessly. The ride hovered over the water, plunged, leapt into the air and pounced upwards as an eagle in flight. After this blood curdling but fun and audacious ride, we advanced towards 'Nemesis', whose forces were stronger than that of a space shuttle. It really was our fate which was doomed! 'Nemesis' was an inverted roller coaster which transported us over a river of cascading water which was coloured red to spook us with the sight of blood. It winded its way through metallic machinery and rocks.It was an extremely adventurous and courage testing ride. After having some spicy snacks at a Mexican food outlet, we moved on to the ride captioned 'Cloud Cuckoo Land' which was a delightful bliss for children. It is aimed at juvenile children and was bejewelled with colourful mushrooms and festooned with trees and gardens just like an exotic fairyland. I went aboard two electrifying rides here. First I went on the swinging ride called 'Twirling Toadstools'. As it soared higher and higher into the air and as the restless gusts of air broke against my face, I could feel my blood pulsing with adrenaline. It was the most exhilarating ride. Next in line was the most enlivening journey through the remarkable 'Chocolate Factory of Charlie'. Its magical aura embraced me warmly. The walls of the factory were wrapped in portraits of Veruca Salt, Charlie Bucket, Mike Teavee, Augustus Gloop, and Violet Beaugarde. The first of the two rides in the factory was the ride in the boat through a river of chocolate. It was really fun as we were surrounded by little islands and went past the chewing gum factory and many other chocolate processing rooms. The other ride was an incredible one on the glass elevator which took us right up to space and then into Charlie's grandfather's room! This ride somehow seemed to end abruptly. Next my sister and I raced to the area named 'Katanga Canyon' where we enjoyed two of the most delightful and groovy rides. First we went to the ride named 'Congo River Rapids'. We were all drenched by the time we ended our ride on the doughnut shaped lifeboat through the swirling fast torrents of the river water and through the splashing cascade. The next ride we savoured was the 'Spooky Runaway Mine Train'. This was a lost train which twisted and rolled throughout its journey. It went twirling through a dark and chilly mine where we could hear the evil goblins cackling. Two rides which my mother, my sister and I really enjoyed were the 'Cable Cars' and Monorail. The thrilling skyride stations had colourful little gondolas which ferried us from one place to another in the sky. While on this wondrous ride through the indigo skies, we could see the jade tree-tops below us while the sun winked from above us. It was a bit scary when it crossed over the Congo River but it was great fun to have the feeling of hanging in midair. The 'Monorail' was a beautifully colourful sky train with live commentating on the whereabouts of the train in Alton towers. It went smoothly from one place to another giving me the feeling as if I was traveling through the air in a train. At about 5:30, my mother sounded the death knell and reminded me that it was time to go. I had hardly covered one fourth of the rides but I knew I had to leave. My heart throbbed unevenly. The very thought of leaving this incredulous rapture was heart-breaking. I silently bid adieu to this enchating amusement arcade. It was a day never to be forgotten. The reminiscence would remain ever vibrant.